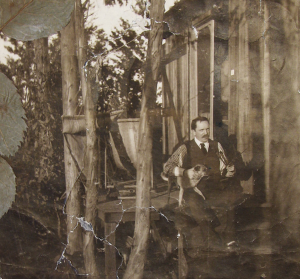 John Clifford Cowles with his Pug, c. 1905. COWLES, John Clifford (1861-1951), was born in Freeport, Illinois on August 21, 1861. Cowles studied painting in Paris at the Sorbonne and was an exponent of the modern French school of painting. He exhibited works in Salt Lake City in 1894 that were highly praised by the local press. Cowles had mining properties in Nevada and Utah. By 1903 he had settled in Los Angeles where he remained until his demise on Feb. 12, 1951. He was the author of The Whispering Buddha. Exh: Calif. State Fair, 1900. This page was last edited on 14 September 2015, at 16:59.